Shown Here Are Hammerworks Royal Barry Wills Colonial Copper Post Lanterns P113 Lighting A Canal Path In Historic Walnutport, PA. Create a lasting impression when you choose Hammerworks Colonial Copper Post Lanterns “Wills” P 113. 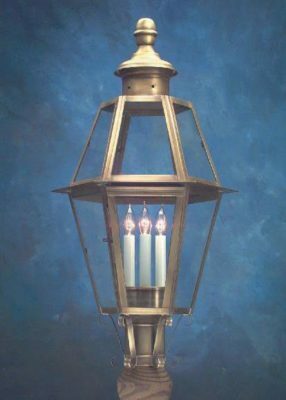 You’ll be the envy of the neighborhood with one of these elegant Colonial Post Lanterns in front of your home. First of all our skilled artisans handcraft these stately period reproduction post lanterns in New England. Furthermore we construct these splendid solid copper Colonial Style Post Lanterns with meticulous attention to detail. While similar in style to Colonial New England Style Copper Post Lantern Large Sturbridge P101 the P113 stands out with its’ distinctive top finial detail. Just as Colonial Boston Post Lantern P103 and other post tops we make Wills P113 with a 3″ post collar. Therefore you can choose any of our Colonial Style Light Poles for your Reproduction Colonial Copper Post Light. 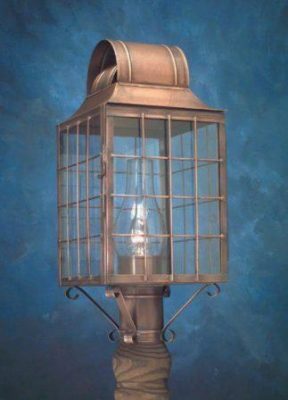 Most notably while we make this Colonial Post Lantern in Verdigris or Painted Black it is unavailable in Antique Brass. Also we supply a single hurricane globe but you can opt for a 2, 3 or 4 candle cluster. No matter which option you choose you can be sure of receiving superb quality and craftsmanship from Hammerworks. Royal Barry Wills the Boston Architect famous for originating the the design of the iconic Cape Cod Style home lends his name to these refined Colonial Copper Post Lanterns. Both the rustic appearance of Cape Cod Style Post Lantern Garrison P110 or the elegant style of the traditional Wills P 113 remain popular alongside the historic architecture of the Cape Cod Home. After 40 years due to our incomparable quality and historical accuracy our Reproduction Colonial Post Lantern styles continue to be a popular choice on streets and walkways in New England and across America. The Wills Colonial Copper Post Lanterns here are lighting a Historic Canal Park in Walnutport PA.